Teer Coatings Ltd » Thin Film Coatings » UK | Magnetrons . 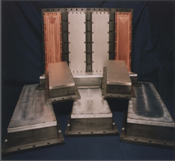 Teer Coatings Ltd specialise in the design and supply of magnetrons, in particular magnetrons with proven capability to support a given process or processes. A variety of unique coatings, including the solid lubricants MoST, Graphit-iC and Dymon-iC, have been developed using Teer magnetrons, providing compelling evidence of the exceptional magnetron designs. Teer Coatings Ltd production coatings business demands exceptional and reliable magnetron performance. All magnetrons are tested in our production or R&D systems, or when not possible in our custom built test facility to prove compliance with customer’s criteria. There is a high demand for the coating of internal surfaces of cylindrical components which is difficult to achieve with existing commercially available PVD technology. 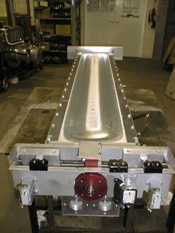 This has led to the development of a new cylindrical magnetron as a coating source. Cylindrical magnetrons are presently available in a range of sizes down to a diameter of 25mm. These produce uniform erosion of the cylindrical target and are suitable for deposition on the internal surfaces of cylinders of 45mm in diameter or larger. The magnetrons are suitable for depositing both directly and reactively sputtered coatings. Reactive coatings can be deposited with the reactant gas flow controlled using either mass flow valves or an optical emission monitor with closed loop feedback control. In certain applications, such as barrel plating, it is necessary to deposit two coatings sequentially. Two magnetrons in a back to back arrangement, where space is limited, provide a particularly neat assembly for this requirement. After depositing the first coating the assembly is rotated so that the second magnetron is in the active position and the second coating can be deposited. The back to back arrangement can be supplied for use with two RF, two DC or one RF and one DC magnetron. Magnetrons can be supplied to match customer specific requirement, including compatibility with most standard vacuum fittings and design of the magnetic field arrangement for optimum performance in a wide range of applications. An example of our custom built magnetrons are the large magnetrons that were designed and built for the UK Astronomy Telescopes in Hawaii and Chile. 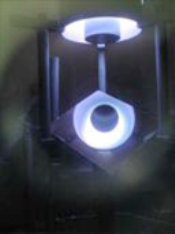 The targets facing system can be used for the deposition of a wide range of coatings. In particular this magnetic arrangement allows the high rate deposition of ferro-magnetic materials. 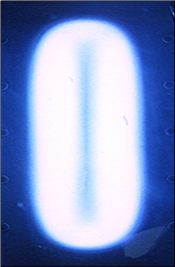 Very high plasma densities are achievable, producing dense coatings with excellent structures. Teer Coatings Ltd can supply a wide range of target materials. With a large supplier base we can source most materials requested. Targets can be supplied for use directly cooled or bonded (with copper or molybdenum backing plates). Production facilities are in place for the bonding of large and small targets, all targets can be machined or manufactured to fit most magnetrons. Teer Coatings Ltd magnetrons can be used in the patented closed field configuration, under most circumstances an automatic licence for the use of the closed field arrangement will be granted. 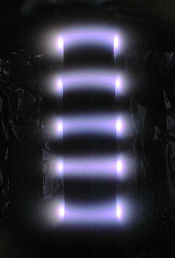 Unbalanced magnetrons are designed in order to increase the ion current at the samples. They are best used in the closed field arrangement. For further information about magnetron design, ion current density, and the closed field system please click here .